After yesterday’s blistering qualifying session where Tom Sykes firmly answered his critics and his own criticisms of the undulating track, an all British front-row and the clouds looking suspiciously grey and familiar to those top three riders, the first race of the day at Portimao started with high expectations. A great start from Jonathan Rea saw him take the lead on the first corner, but it was Melandri – fast all week in practice – who took the major leap, jumping into second, ahead of Sykes and nudging Chas Davies into fourth. By lap three, Sykes – taking his time and following his own mantra of ‘steady away’ – took the advantage over Melandri towards turn one and began his chase of the Pata Honda piloted by Jonathan Rae. Within a lap, Sykes- taking advantage of the Kawasaki’s top speed and the slipstream - was in front. 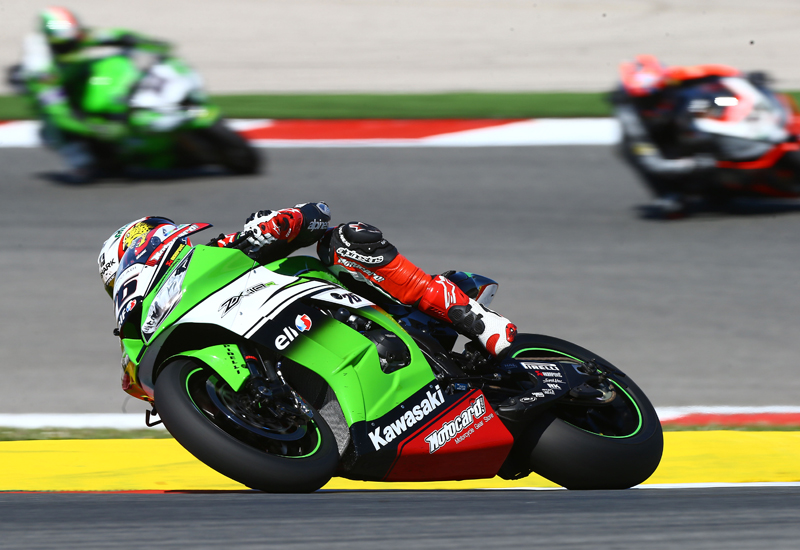 With Sykes’ teammate, Loris Baz chasing and getting the measure of Rea by lap six, it was left to Melandri - now second – to break up the Kawasaki Racing Team party. By lap nine, this resistance was over and Baz moved into the place behind Sykes. Quietly progressing his way through the pack, Sylvain Guintoli on his Aprilia RSV4, stealthily took the chasing pack by surprise and moved from fifth through to second in the course of lap eleven. On the same lap, as white flags were being raised for rain, Leon Haslam – on turn five – and having posted some significantly quick times, lost the front-end and found the bike slipping away, taking the chasing Ducati of Chaz Davies along with him. The slight rain seemed to favour the chasing Guintoli, with Sykes’ times gradually slowing, but as the flags were put away, and the skies brightened, Sykes dropped the hammer and extended his championship lead to forty-four points, ahead of the second race later in the afternoon. Elsewhere on track, Voltcom Crescent Suzuki’s Alex Lowes – suffering from a slight injury after his crash in qualifying yesterday - finished a spritely sixth. Chaz Davies, after qualifying for the front row, came in a lowly eighteenth after his collision with Leon Haslam – who picked himself up to finish eleventh. Sykes, speaking after the race was visibly pleased, 'It wasn’t the best of starts, but I settled in after a couple of laps and managed to get to the front. But then the rain came andI thought ‘here we go again!’ but I asked someone [in my head] very politiely to remove the rainclouds and I was lucky that they heard me. 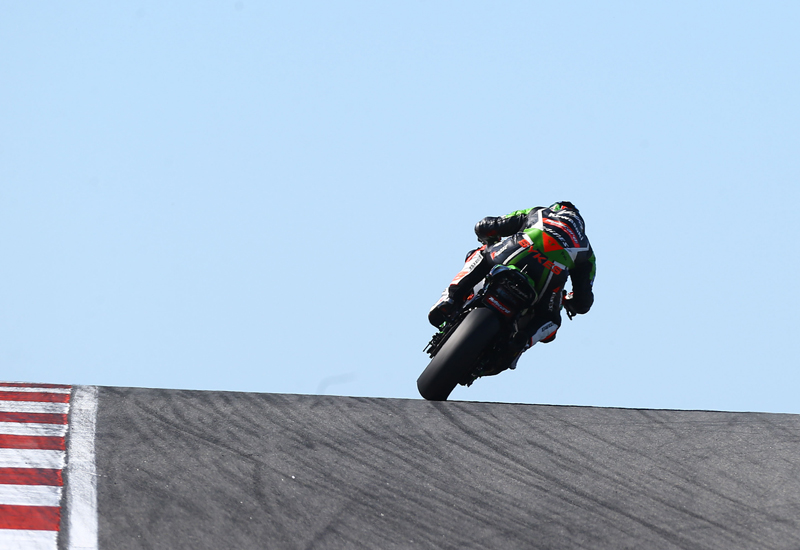 Tom Sykes secured a brilliant race one win after a tense battle with Carlos Checa at Portimao today.